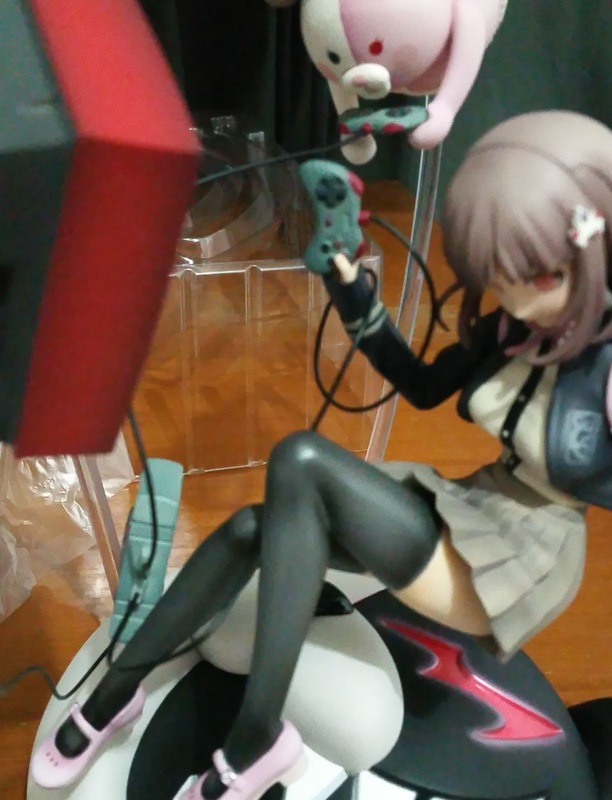 Figure Unboxing and Review: (Part III) Review of Nanami Chiaki & Monomi by Phat Company! Oh? Is Chiaki gaming too, I want in! Welcome to the very last part of this trilogy where I will be talking more about the sculpt of Chiaki and Monomi who are (most likely) the stars of this figure, given that they aren't outshone by the fabulous base yet! 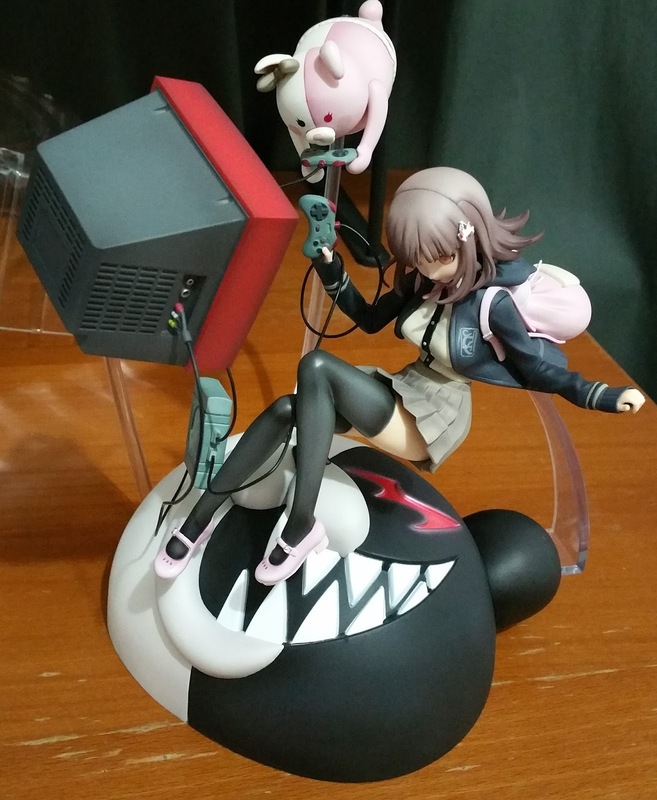 You may argue that Monomi is part of the base but I would like to deny that since she exhibited her own personality and ideals in the series that I would like to consider Monomi to be more important than simply a part of the base for Chiaki. 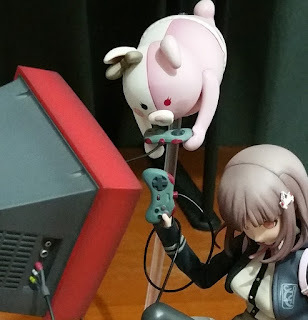 And as usual, let's keep the best for the last and start with Monomi first. 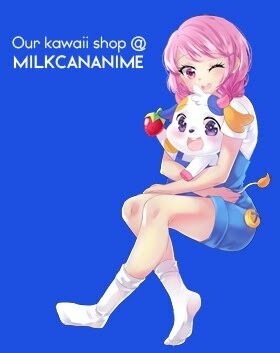 Monomi is Monokuma's younger sister and unlike her brother who comes in black and white, she comes in a more feminine mix of pink and white (which, also happens to be my favorite combination of colors for a feminine touch)! She is also shaped as a rabbit instead of a bear. 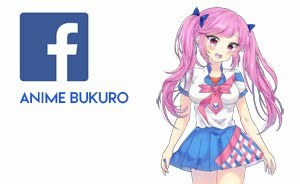 And... as if to further showcase her younger age factor (and to stop her design from being NSFW...(maybe?) she comes with a frilly diapers too. 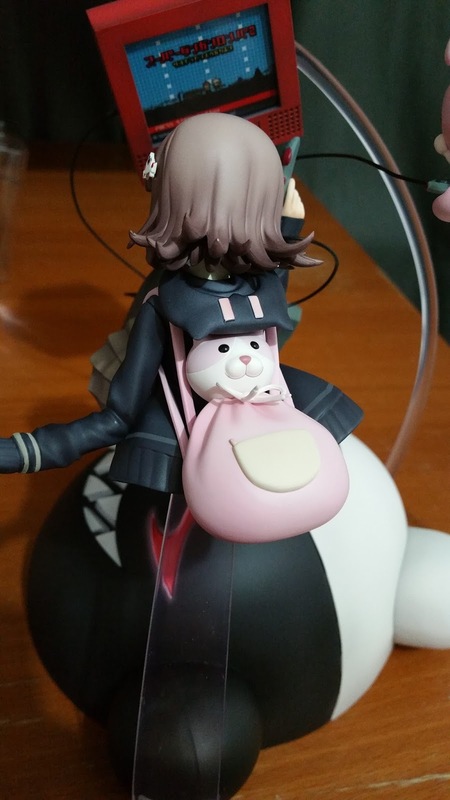 From both images above which zoom in on Monomi, you can see that she comes with rather a darker shade of pink (close to red) that goes between the pink and white halves and line the rim of the diapers. 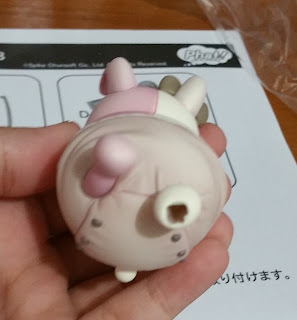 This is a shading system that Phat Company decided to use for Monomi, probably as pink and white are too close in shade and this darker line helps to show how the two are portioned on Monomi better... but it just looks to me as horrid seam lines. I am unsure if this only happens on my copy or is it a common issue but in either case, it isn't too jarring as Monomi only occupies a small space and area of focus in the figure as she is easily outshone by both the base and Chiaki. The aforementioned is however, saved by the fact that the diapers are very detailed. 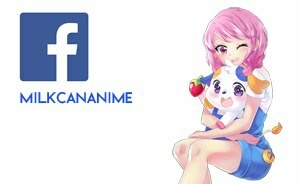 This may sound a little strange and even perverted now but trust me, if you keep reading you'll come to the same conclusion too. From the back of this figure you see two things at once. 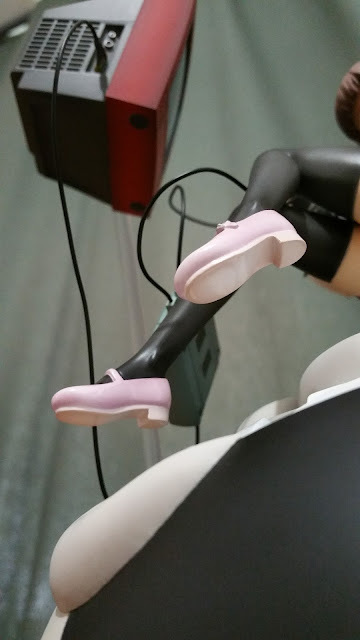 First the peg hole on Monomi's left sole, which is in this strange unique shape to orientate insertion of the stand at the right angle. The second are the creases and buttons on the diapers which are realistically placed and very elaborate. You can even see how the material tightens and pulls around her legs! 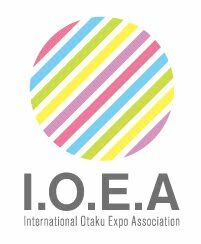 Next we will look at the front of the diapers which is segmented into two parts due to the lining of two different colors. The dirty pink all around and the dusty white in the middle portion, which is lined on either side with all the dull gold buttons. 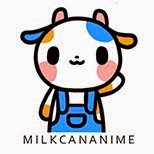 The dirty look of the diapers contrasts well against the clean pastel colors that Monomi comes with! 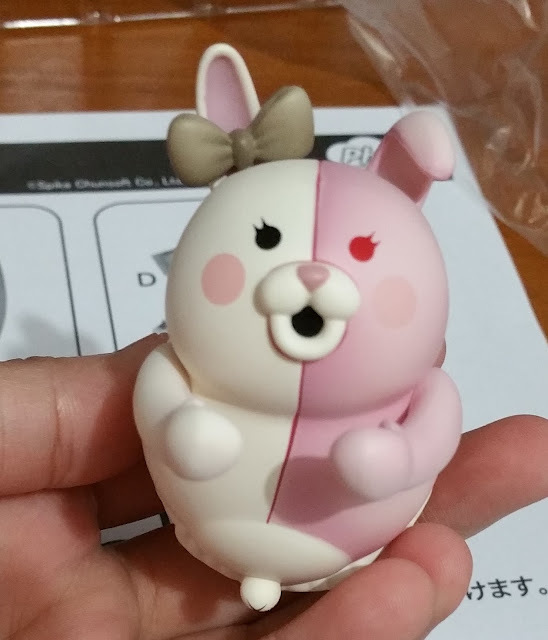 Similar to her brother, Monokuma, she has the colored half coming with a red eye and the side on the white half, with a black one instead. In addition, she also comes with blush at her cheek area to further accentuate her femininity! There are many pretty points about her that I would love to cover in detail one by one. Let's go from the top down and talk in length about each of them. Chiaki comes with a hairstyle that is commonly seen in the 3D world but not actually replicated much in the 2D world. 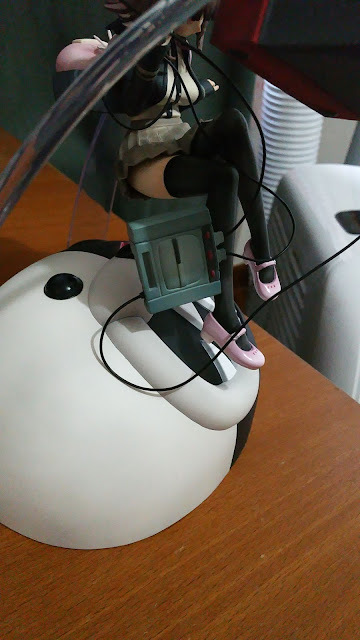 Her tousled hair bent at the ends and bending outward is now in figure form! 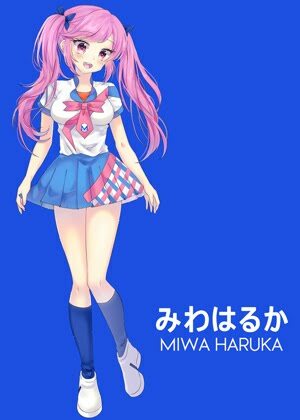 As you can see in the image above, her hair parts come with 2 very obvious seam lines, the first to join both the front and back parts together and the second, around the thick strand right above her left ear. 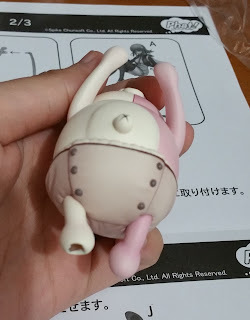 Fortunately, the rest of her hair sculpt is close to perfect and the tips of her hair strands are all sharp and delicate looking and her hairclip (which is of a retro game console design) is accurate and very cute. 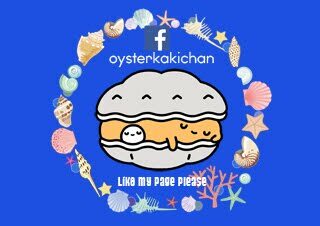 Even the pixelated form is endearing to me! 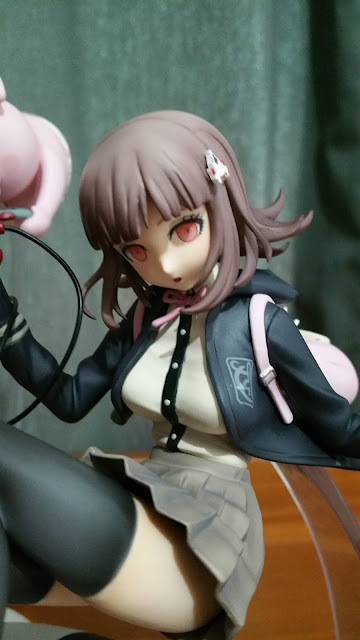 Her eyes may appear rather emotionless but that is exactly how the eyes of Danganronpa people look, and even the eyelashes look exactly like it. 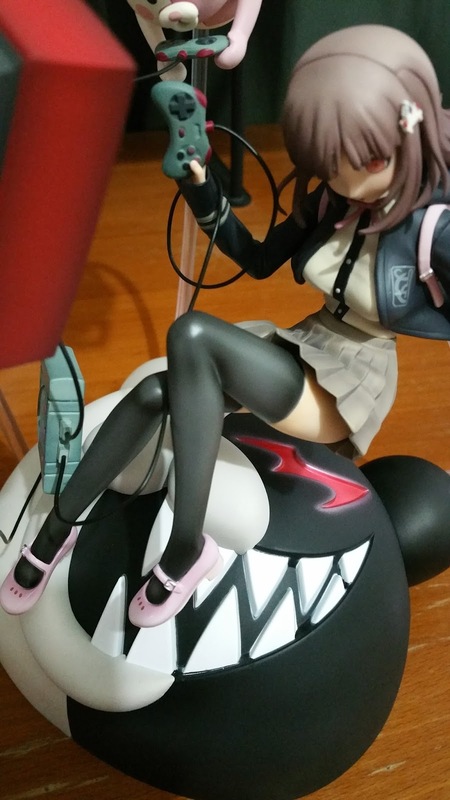 I feel that Phat company makes the best faces, seeing how I find their take for faces for Idolm@ster and Danganronpa, the most accurate among all the various other companies. However, as you can see from the image above, her face shape may look slightly off based on how the lighting shines on it. For instance, I do find her nose placed a little too low when seen in the image above. Moving down to her outfit we can see how beautiful the navy jacket contrasts against the otherwise light colors on this figure. On top of the left breast is a very clean, milky-white painting of a logo and this crisp painting is also seen on several other areas such as the sleeves and the band around the bottom of her jacket. Another point which I'll like to make about this jacket is that the fold of material above the zip is sculpted and appears to be hiding the zip. Terrific! Her white blouse is immaculately creased and showcases the size of her rather large bosom. The creases show how tight the material around her chest is while still manageable loose around her waist. As her blouse is tucked in, we get a full view of how small her waist is, illustrated by the band of her skirt. 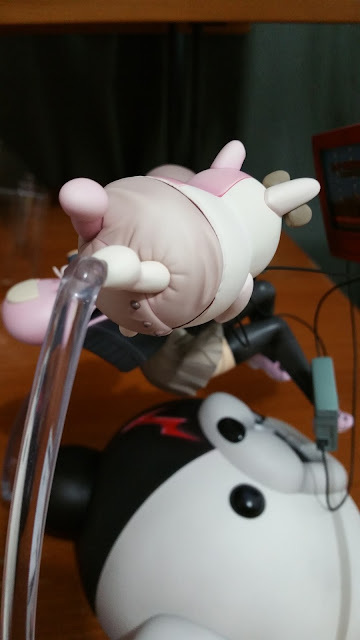 The skirt is also creased and lifted up, as if painting a scene where she is thrown up into the air by the Monokuma chasing after her. From the back we can now see that Chiaki's jacket comes with a hood that has kitty ears as well as pink rectangular stripes for eyes. She also comes with a cute little pink bag that has a kitty on the top as a decorative piece as well as a white flap. I love how the weight of the bag seems to be at the end of it (realistic) and the creases at the cat's neck, showing the dynamic movement. Likewise, the straps of the bag are taut and adds to the feel of how dynamic it is. Another honorable mention is how the white ribbon is raised in the air to show how it is lifted by the wind due to the movement. 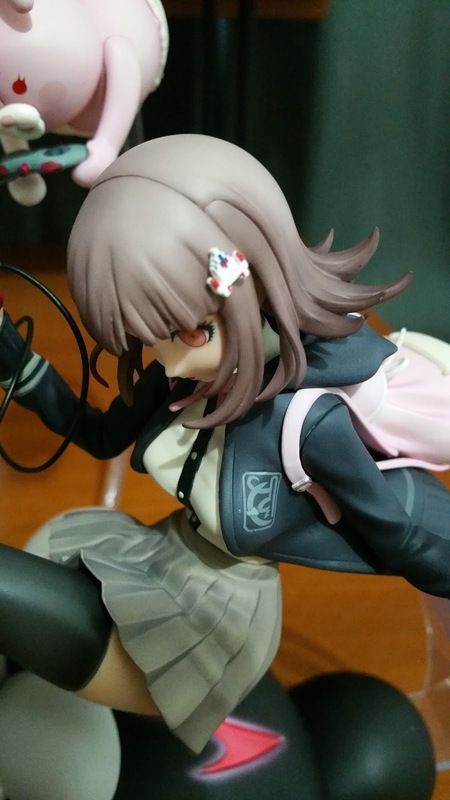 Taking another view of Chiaki, we can now not only appreciate how her hair sculpt is so lovely but also how her jacket billows out at the bottom. 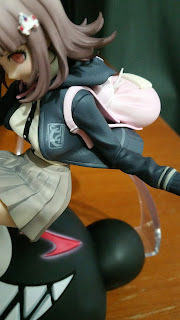 The straps on the back look quite fake in comparison as they look glued on instead of delicately sculpted on to make it thinner at the ends to meld almost completely into the bag. 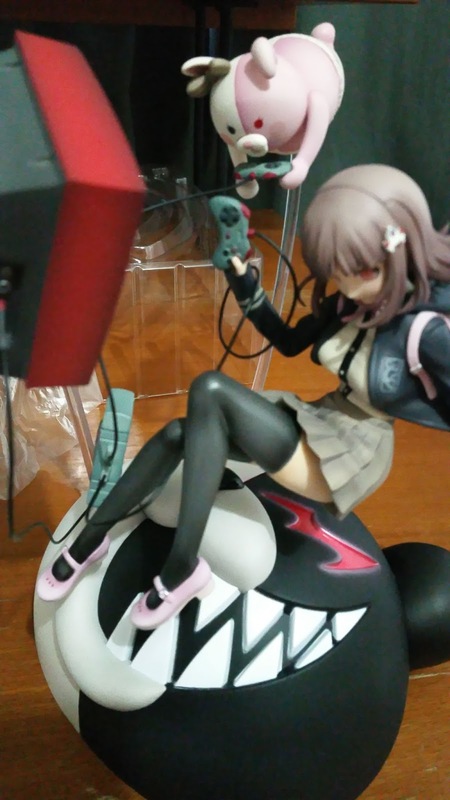 Next, let's look at the shoes Chiaki comes with. 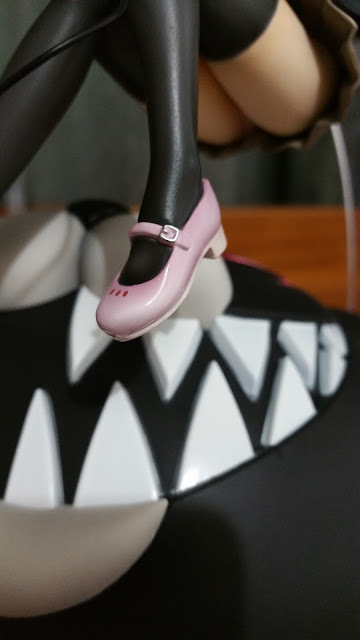 Her shoes are painted in a glossy pearl pink paint which makes it look so chic and cute. The heels are in a lighter shade, and matte pink which adds dimension to the colors. Not to mention that it also comes with finer details like the belt and buckle as well as the three holes at the toe of the shoes. Unfortunately, the soles do not come with any design to them and is completely smooth. Though it doesn't look like it has much in the department of friction, it comes with slight grey shading around the perimeter. 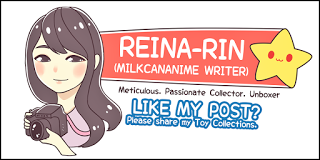 The last point which I would like to make is about how skin tight the stockings are. In the right lighting, they look pale around the thigh and calf area which makes it look stretched out and slightly translucent. 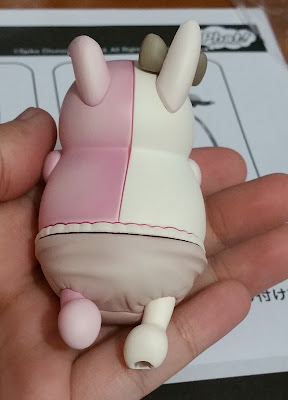 For anyone who likes thigh-highs, this is definitely a great detail to behold! I absolutely loved this figure, in particular, the assembling process. 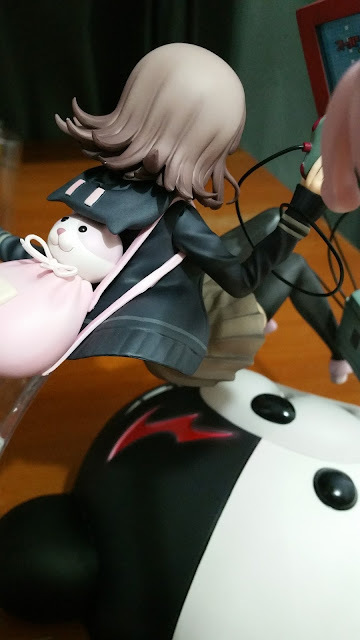 I definitely do not regret buying her and would highly recommend her to anyone who is a fan of the franchise or love figures with lovely bases! 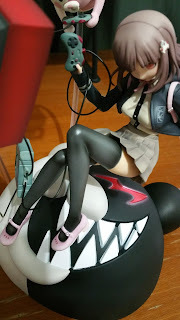 No Comment to " Figure Unboxing and Review: (Part III) Review of Nanami Chiaki & Monomi by Phat Company! "